A day after Governor Scott Walker won his recall election, the New York Times wrote, "The biggest political lesson from Wisconsin may be that the overwhelming dominance of money on the Republican side will continue to haunt Democrats." Democrats have drawn much the same conclusion. "You've got a handful of self-interested billionaires who are trying to leverage their money across the country," said David Axelrod, Barack Obama's senior campaign strategist. "Does that concern me? Of course that concerns me." But then how to explain the landslide victories in San Jose and San Diego of ballot measures meant to cut public-sector retirees' benefits? What should concern Axelrod far more is that on the central issue of the recall--the costs of public-sector employees--the Democratic Party is wrong on the substance, clinging to its constituents rather than doing the right thing. Warren Buffett calls the costs of public-sector retirees a "time bomb." They are the single biggest threat to the U.S.'s fiscal health. If the U.S. is going to face a Greek-style crisis, it will not be at the federal level but rather with state and local governments. The numbers are staggering. In California, total pension liabilities--the money the state is legally required to pay its public-sector retirees--are 30 times its annual budget deficit. 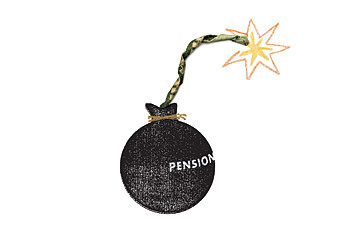 Annual pension costs rose by 2,000% from 1999 to 2009. In Illinois, they are already 15% of general revenue and growing. Ohio's pension liabilities are now 35% of the state's entire GDP. The accounting at the heart of government pension plans is fraudulent, so much so that it should be illegal. Here's how it works. For a plan to be deemed solvent, employees and the government must finance it with regular monthly contributions. The size of those contributions is determined by assumptions about the investment returns of the plan. The better the investment returns, the less the state has to put in. So states everywhere made magical assumptions about investment returns. David Crane, an economic adviser to former California governor Arnold Schwarzenegger, points out that state pension funds have assumed that the stock market will grow 40% faster in the 21st century than it did in the 20th century. In other words, while the market has grown 175 times during the past 100 years, state governments are assuming that it will grow 1,750 times its size over the next hundred years. Why has this happened? It's democracy at its worst. Public-sector unions, powerful forces in states and localities, ask for regular pay increases. Governors and mayors can dole out only so much in salary hikes because of requirements for balanced budgets or other constraints. So instead, they hand out generous increases to pension benefits, since those costs will hit the budget many years later, when current officials are themselves comfortably in retirement.